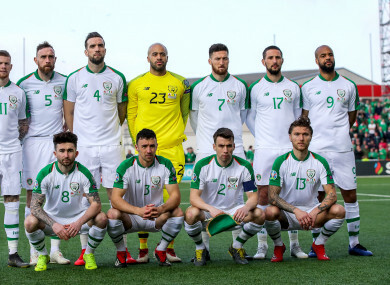 The Ireland team pictured before the Gibraltar match. DARREN RANDOLPH WILL almost certainly play from the start, having made that one excellent save to prevent Gibraltar going ahead on Saturday. The central defensive pairing of Richard Keogh and Shane Duffy is likely to remain unchanged, provided the latter is adjudged fit after picking up an ankle injury. If not, John Egan, who has impressed since signing for Championship promotion contenders Sheffield United in the summer, could be drafted into the starting XI. At full-back, Seamus Coleman will likely retain his place. After McCarthy admitted the Matt Doherty right-wing experiment failed, the manager could be tempted to pick the 27-year-old as a left-back, where he has played before at Wolves. Dropping Enda Stevens would be slightly harsh, given that the player was hardly much worse than any of the others who played at the weekend, but leaving out Doherty would be similarly contentious on account of the player’s excellent Premier League form. Probably the area where there is the least amount of certainty in terms of starters. Conor Hourihane was one of the few players to emerge from the Gibraltar match with a degree of credit, while Jeff Hendrick took his goal very well. Ireland are unlikely to field as attacking a line-up as they did against Gibraltar, so Harry Arter may also feature to provide more defensive cover. The Bournemouth player, who is on loan at Cardiff, came off the bench on Saturday. Should McCarthy opt to go with that trio, it would mean ditching out-and-out wingers. James McClean has served Ireland very well in the past, but he was ordinary at the weekend, and his club form in recent seasons has been similarly inconsistent, so he may well struggle to retain his place in the team. Robbie Brady, if McCarthy deems him match fit having found game time hard to come by at Burnley, is one player capable of playing at the tip of the diamond. If not, Hendrick and Alan Judge are also familiar with that role. Jack Byrne has similarly impressed in the position, though it would be a surprise if McCarthy opts to select the Shamrock Rovers youngster given his lack of experience at international level. It will be interesting to see whether McCarthy opts to keep faith with Sean Maguire and David McGoldrick up front. The manager may be tempted to play Luton’s James Collins, who is the top scorer in League One with 20 goals. McGoldrick did at least provide a superb assist for the winning goal against Gibraltar, showing pace and intelligence to evade his marker and pick out Jeff Hendrick. Maguire, meanwhile, will likely be better suited to playing against a team who don’t just largely sit back with 11 men behind the ball, with more space to exploit owing to his pace on the counter-attack. Email “Do you agree with our Ireland team to face Georgia?”. Feedback on “Do you agree with our Ireland team to face Georgia?”.